Auto manufacturers are rushing to bring affordable, energy efficient vehicles to market. Primarily due to our desire to free ourselves from the grip of oil and to mitigate the long term damage that vehicles have on the environment. Below is an example of what’s to come in the world of electric powered vehicles. 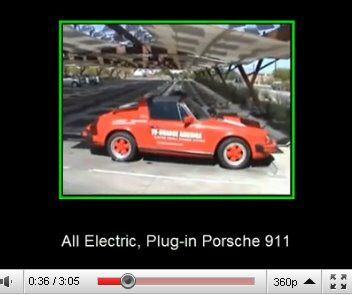 In the video below you’ll see an electric powered Porsche 911 pull into an electric vehicle charging station. The driver proceeds to pull out what appears to be an extension cord, plug in his Porsche, and then be on his way to do some shopping. Toward the end of the video, you can hear the driver state that the current charge time will allow about 125 miles of driving.